We didn’t exactly ask for it but we’ve got it. At last we have two massive restaurants selling generally average pizzas. As an added bonus they’re both within a couple of meters of each other, which is handy if you really like pizza. It’s odd as Moseley hasn’t really expressed much of an interest in pizza previously. We’ve lived with Al Capone’s sorry attempts at pizza and hygiene for years and we’ve been largely happy with that. There certainly isn’t much indication that there is a latent population of pizza lovers that can fill nearly 150 covers a night spending an average of £11 on a pizza. There is an old truism in Moseley retail, nobody can have an original idea. If you open a curry house then in months there will be six of them. If you want to run a hairdressing business then in minutes there will be another five, that doesn’t include barbers, which we have three of. We have a population of around 8000 people and eight places to get your hair cut. We’ve watched this with bewilderment for years but opening two almost identical restaurants within months of each other is just ridiculous. Opening two massive restaurants demonstrates little comprehension of how business works. The natural customers for both are people entertaining their parents who are up from Suffolk for the weekend, who don’t like curry, or leaving dos for people that have just finished working at the Council after twenty years. It’s probably fair to say that at least the market for the latter is growing, but not enough to fill both of these on nightly basis. So one of these is going out of business, once they have bled their parent companies dry. Though we should thank them for doing a really good job of bringing to disused buildings into use. Technically the Consol World Class Sunbeds wasn’t really disused but that undermines my point. There has been lots of local nattering about the harm that chains will do coming into Moseley. The issue isn’t the corporate structure of businesses, it’s the absolute deficit of imagination. Let’s hope that when one of these goes bump someone pops up with something vaguely different. 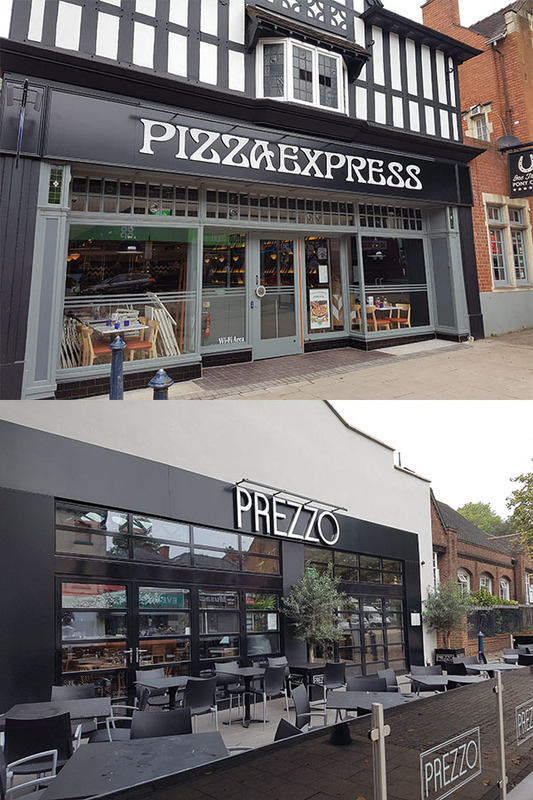 There is a subtle but important difference between Pizza Express and Prezzo which has only become apparent to me in recent months. That difference if that a Pizza Express children’s meal contains a pizza too small to satisfy a hungry 9 or 11 year old, whereas a Prezzo children’s pizza is no different from an adult-sized one. And for that reason alone our allegiances have recently switched between otherwise identical chains. Prezzo also sell their healthy option pizza. Which is the same pizza but slightly smaller and costs slightly more. It’s cheaper to buy the bigger pizza and just leave some. You’ve forgotten Ponte di Legno which does great Pizza (and Pasta), and works relatively cheap too once you factor in bring your own drinks. Hard to see why anyone would choose Pizza Express or Prezzo over Ponte. I’ve no factual basis for this at all, but I’ve always assumed Ponte de Legno was run by the same group of people who ran the Indian restaurant that preceded it at the same location. Presumably the curry game wasn’t working out and they saw the way the wind was blowing in Moseley 10 years before anyone else and decided to have a bash at pizza. This was based on my belief that when it reopened one of the waiters looked a lot like one of the guys who worked there before and had an unconvincing Italian accent. It’s all a far cry from Little Italy and enjoying a £5 lasagna in a damp basement. I think that’s right, it was the Royal Naweed. Which was why I was a bit dubious when it opened. The Naweed was one of the worst curry restaurants that has ever existed. Many people got poisoned in there. It seems they’re slightly better at making Italian food.